OBD scanners are devices that let you read and diagnose error codes your car displays. Without them, you won’t know what’s wrong with your car. In fact, mechanics, too, use these devices to diagnose car problems. There are two main types of OBD scanners on the market: OBD1 and OBD2 scanners. But, what is the main difference between OBD1 and OBD2 scanners? OBD is onboard diagnostic, a process to scan vehicle with an onboard computer. In its early phase, the development of OBD system was mainly to turn on the malfunction light in cars. Later more standardized and vehicle’s information was developed in OBD1 and OBD2 respectively. In this article, we will explain in details the difference between OBD1 and OBD2 scanners. 5 Who Are OBD1 and OBD2 Scanners Built For? 5.1 OBD1 Scanners built for? 5.2 OBD2 Scanners built for? In like manner, OBD2 is an advanced technology improved from OBD1. Thus, OBD2 provide better and more standardized vehicle protocols and system checks data. OBD1 needs corded connection while OBD2 can be connected hands freely via Bluetooth or wifi. Last but not least, the use of OBD2 is more universal and reliable than OBD1 thanks to its wider compatibility. Works wirelessly via Bluetooth or WiFi. Corded options are also available. Can check sensor and actuator for signs of high resistance, opens, and shorts. All out of range values are sent to the ECM. Capable of performing all OBD1 scanner functions along with additional ones such as graphical representation of data, customization, smog tests, performance level, battery usage. OBD1 is a diagnostic system that only supports cars made before 1996. Introduced in 1991, it does not support all older models. The downside of these scanners is that they are manufacturer specific. One scanner won’t work on two different brands even if they have the same issues. For example, An OBD1 scanner for Toyota won’t work for Ford. OBD1 scanners offer basic functionalities. They can check the emission system, read and monitor engine performance, and produce warning messages. However, these messages only contain basic information. They only inform of the problem with no details of where the problem actually is. But they do have their benefits. They can enhance the engine’s life. They support almost all models made in 1996 and after including a limited number of hybrid and electric vehicles. They do not only offer basic features but come with advanced functions as well, based on which OBD2 scanner you purchased. Coolant Temp, DPF Temp, Fuel Pressure, Smog Testing, Fuel Trim and O2 Sensors. Anti-brake Lock System, Video Relay, Air Bag Problems, and Key Coding. Moreover, OBD2 scanners provide great customization and can also let you view data in graphical forms. They also pinpoint towards the problem and suggest reliable repair and fixes, unlike OBD1 scanners. 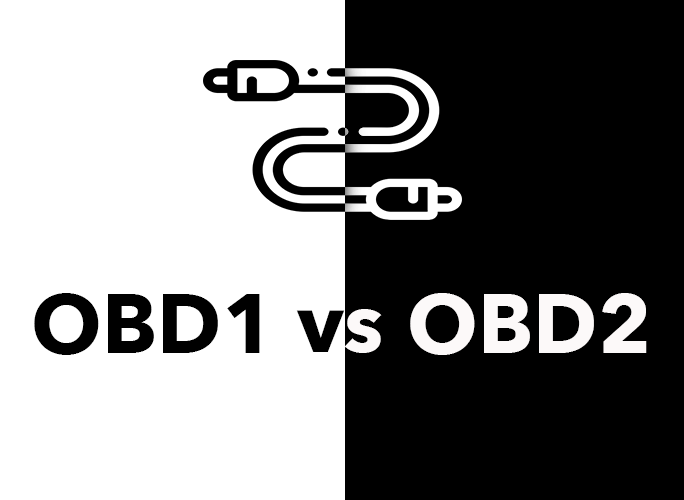 OBD1 vs OBD2 war ends at OBD2 scanners being a better choice. However, you should pick a scanner based on what your car supports. An OBD2 scanner might offer more functionalities but it would be useless if your car does not support it. 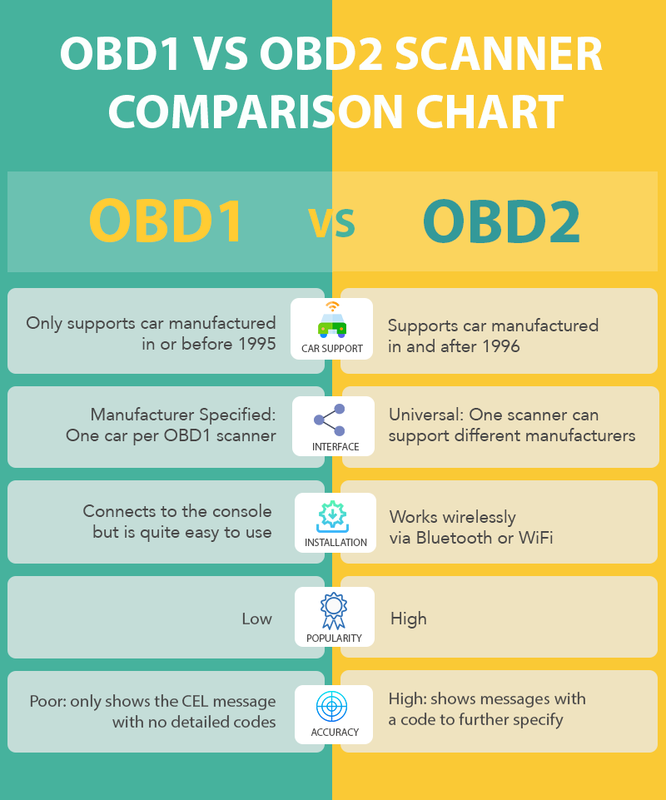 Who Are OBD1 and OBD2 Scanners Built For? OBD1 scanners are people who own older cars that do not support OBD2 scanners. Cars manufactured before 1996 are OBD1 compatible. They are easy to use but do not work wirelessly and also offer limited functionalities. Such car owners may also opt for an OBD1+OBD2 scanner that supports both older and newer models and offers a mix of OBD1 and OBD2 functionalities. OBD1 scanners can help solve minor problems as they do not offer advanced functionalities. However, the fixes are not always reliable and typically only highlight problems with ECM, ABS, and Transmission. Some of these devices come with a built-in memory to store codes but these codes can be hard to read. People who own vehicles made in 1996 and years after can go for OBD2 scanners. If you want to be a pro at solving car problems then we recommend an OBD2 scanner that can offer both basic and advanced functions. Some advanced scanners are suitable even for mechanics. However, if you do not know much about cars then a basic OBD2 scanner would be good for you. Advanced functions will anyway not do you any good if you lack car knowledge. OBD2 scanners are easy to use and work wirelessly but some corded options are also available. Most support a number of apps and provide easy to read data with reliable fixes.